Sr. Nancy was born in Bridgeport, CT to Mary Maraffi and William Malone in 1931. Shortly after graduating from the College of New Rochelle in 1953 she entered the Order of St. Ursula. As Mother Mary Augusta she earned a MA in Classics from the Catholic University of America, and began a ministry in education spanning half a century. Sr. Nancy taught at the Ursuline School, the Bethesda Ursuline Academy High School, and the College of New Rochelle. 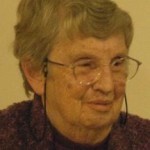 After receiving a Master’s degree in Theology from Harvard Divinity School, Sr. Nancy became project director and editor of The Church Society for College Work in Cambridge, MA, a regional director of the National Institute of Campus Ministries, a lecturer at Intercommunity Novitiate, Mariandale. Her career as an editor includes the Seabury Press, Religion and Intellectual Life, Cross Currents and Bylines. Sr. Nancy Malone’s books include Seeds of Grace, and Walking the Literary Labyrinth: A Spirituality of Reading. Sr. Nancy continued to lecture and write through her retirement. Sr. Nancy served on the Inter-religious Council in New Rochelle, as a board member of the Church Society for College Work, and the Association for Religious and Intellectual Life, and the Ursuline Association for Higher Education. A wake will be held at the Ursuline Province Center, New Rochelle, NY on Thursday, March 28, 3:00-4:30pm, with a prayer service at 4:00 pm. The Mass of Christian Burial will be celebrated at the Province Center Chapel at 4:30 pm on Thursday, March 28. Burial will be in Holy Sepulchre Cemetery. In lieu of flowers, gifts may be made to the Ursuline Sisters Retirement Fund at the Ursuline Provincialate, 1338 North Avenue, New Rochelle, NY 10804.